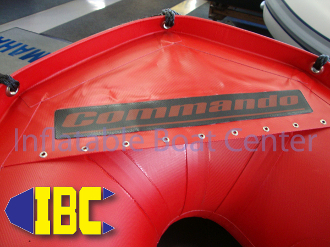 This inflatable boat package features the red C4 Commando and a Yamaha F25 with a 6 gallon fuel tank. The Bombard Commando C-4R is the second boat in the Commando lineup but in "Rescue Red" and Mike's choice when providing event safety boat support or rescue operations. The Bombard Commando C4R packs in jaw dropping performance and reliability into a package that fits into a patrol car or operations truck. Able to take up to a 50hp, and with available IBC Jet mods the Commando C4R will out perform anything else in skinny and fast water rescue scenarios. Make no compromises in tough water situations, insist on a C4R. Used by Marine Biologists, Oceanographers, Fire Dept. Rescue Teams, recreational boaters, divers, fisherman, and police world wide. Considered one of the best boats afloat today. This is Mike's favorite boat and the one he operates here in the Pacific Northwest in the mountains, deserts, bays and the oceans. The "Go anywhere and do anything" capabilities of this boat make it one of our Top Three Picks and one of our top rescue boats when high perfromance is the requirement.